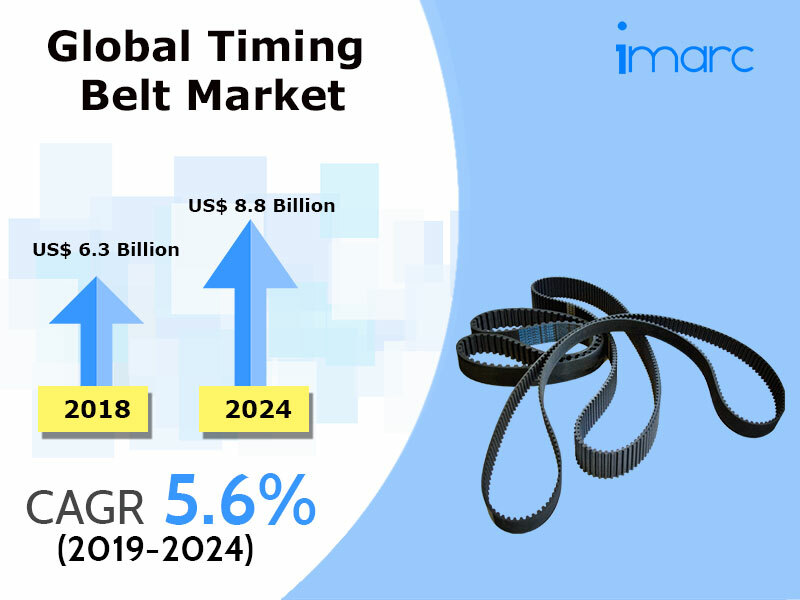 According to the latest report by IMARC Group, titled “Timing Belt Market: Global Industry Trends, Share, Size, Growth, Opportunity and Forecast 2019-2024”, the global timing belt market reached a value of US$ 6.3 Billion in 2018. A timing belt is a part of an engine that is used to create sync between the rotation of the crankshaft and camshaft. It aids in opening and closing engine valves during the intake and exhaust strokes of each cylinder. It is a synthetic rubber strap consisting of fiber strands that offer strength and nylon-reinforced cords that assist in extending its lifespan. It also comprises teeth on the inner surface which fit into the grooves on the end of the camshaft and crankshaft to avoid slipping. Apart from being used in automobiles, it is also employed in water and oil pumps and balance shafts. Rising sales of new automobiles owing to escalating global population and inflating income levels is catalyzing the demand for automotive timing belts. Moreover, these belts require frequent replacement as their expected lifespan is approximately 60,000 and 100,000 miles. Consequently, there is a proliferating demand for these belts from the replacement segment. Apart from this, manufacturers are continually investing in research and development activities in order to introduce improved variants. For instance, the newly launched timing belts come with fiber-reinforced materials containing glass-fiber which offers relatively more durability, strength and corrosion resistance. Owing to the aforementioned factors, the global market is estimated to reach a value of US$ 8.8 Billion by 2024, expanding at a CAGR of 5.6% during 2019-2024. On the basis of the drive type, the market has been divided into dry belts, chains and belt in oil. Amongst these, belt in oil type represents the most popular drive type. Based on the component, tensioner holds the dominant market share. Other major segments include idler pulleys, timing shield/cover and sprocket. On the basis of the vehicle type, the market has been bifurcated into passenger and commercial vehicles. Currently, passenger vehicles account for the majority of the total market share. Based on the distribution channel, the market has been bifurcated into OEM and aftermarket. Presently, OEM represents the most popular distribution channel for timing belts. On the geographical front, the market has been classified into Europe, North America, Asia Pacific, Middle East and Africa, and Latin America. Among these, Asia Pacific and North America are the major markets for these belts. The competitive landscape of the market has also been analyzed with some of the key players being B&B Manufacturing, ContiTech, The Carlstar Group, Gates Corporation, ACDelco, J.K. Fenner Limited, Federal-Mogul Motorparts Corporation, Bando USA, Dayco, Ningbo Beidi Synchronous Belt, Goodyear SKF, Ningbo Fulong Synchronous Belt, MAHLE Aftermarket and Tsubaki.